What kind of workplace will you choose to create? Thriving employees are likely to be more committed and satisfied with their jobs, perform at a higher level, become sick less often, give back more to their communities, and get more fulfillment from personal relationships. 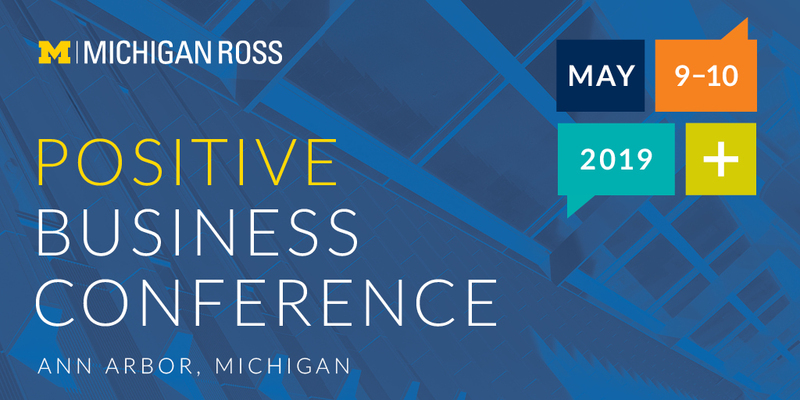 Discover how to improve well-being and performance by building a thriving workplace at the Michigan Ross Positive Business Conference, May 9-10, 2019. We’ll share research-based strategies, tactics, and tools and real world examples for how to build stronger, more connected teams and companies. You’ll engage with Michigan Ross faculty experts as well as leaders from Consumers Energy, O.C. Tanner, Steelcase, United Healthcare, Zingerman’s, and more. Join us at the Positive Business Conference to learn how to create a healthy, happy, and thriving workplace to change business for the better. Visit positivebusinessconference.com to learn more and register to attend.